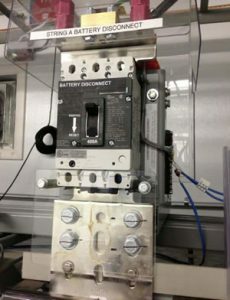 EEE Battery Disconnects for DC Power Plants provides a simple means to isolate a string of batteries for maintenance purposes. In addition, some local municipalities or fire department regulations require a remote means for disconnecting the battery string in the event that emergency personnel need to enter a facility. The EEE (Electric Equipment & Engineering Co.) DC disconnect, with a remote EPO switch, addresses this requirement. EEE’s battery disconnects are mounted on top of the battery rack and require no additional wall space. These disconnects are supplied with custom mounting kits and custom battery side termination plates, eliminating the need for cable between the battery and the disconnect. A disconnect can be configured to protect against overload and short circuit conditions. They can be manually or remotely operated. D.C. disconnects are commonly used as a means to isolate a battery for maintenance purposes or to provide a means for personnel to manually or remotely disconnect the battery during an emergency situation. The ability to remotely operate the disconnect, addresses code and electrical inspector issues. Disconnect can be configured as a switch or as a current limiting breaker. Designed for “out-of-the-box” direct interface to over 165 industry standard batteries, each disconnect is supplied with a pre-manufactured mounting kit and copper termination plate. Expected installation time is 30 minutes. Internal Form C auxiliary contact (dry) is pre-wired to terminal block to report if the disconnect is open or closed. Disconnects rated 1200 through 2400 Amp will accommodate four load cables. Other options available. Load cables on all disconnects terminate with 2-hole lugs either on 1” or 1-3/4”centers. 24, 48, 125 or 250 VDC shunt trip, installed internally, for remote open capability. The shunt trip is fused and pre-wired to the terminal block for customer interface.